Reduce hamburger calories just by making your own burger. My cheeseburger has 437 calories. A Whopper with cheese has 720 calories. I left approximately 25% and didn't finish my chips. 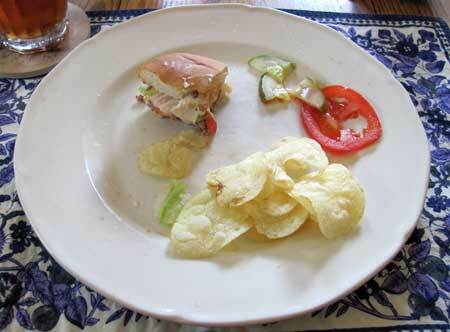 Reduce portion sizes of your homemade cheeseburgers for serious low calorie fast food. My cheeseburger has 437 calories. A Whopper with cheese (same amount of ground beef, 1/4 lb.) has 720 calories. I can make my hamburger and clean up in under 30 minutes. I save money and my cheeseburger tastes better! Make a similar portion size adjustment every day for a year and lose 18 pounds with no other changes to your diet or exercise activity. Either way, it's easy to cut hamburger calories. So what do you think... Should cheeseburgers be a part of your healthy lunch ideas? Making hamburgers at home is quick, easy and fun. I urge everyone to develop their own favorite hamburger recipes with lean beef and quality, fresh ingredients. If you have never made your own hamburger, start here for hamburger tips and the Best Hamburger Recipe. Then try my Green Chili Cheeseburger for a twist. 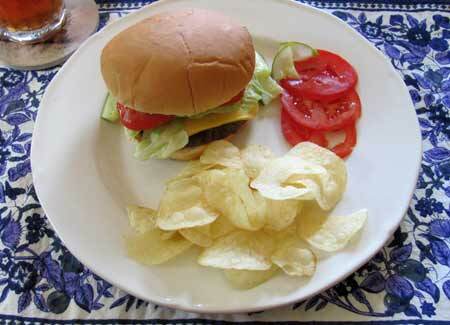 My best hamburger recipe can cut 124 calories by using ground beef with reduced fat content. See how easy it is to cut calories and fat without sacrificing flavor here.